Rear mount Merc 6 cyl turbo low k diesel, 6 speed synchro, 57 pass cloth seats, interior as new condition, 39' 6" or 12 mtr. Flat floor no wheel arches with 6' 5.25" interior height. Large bins with locks. Full airbag suspension. Air brakes, maxi brake, exhaust brake, power steer, tilt and telescopic steer, steering lock, easy clutch, long range tank, tinted bonded windows with lockable hoppers, flat tinted screens, Isri drivers seat, electric delay wipers, heaters, ceiling hatches, air lockable coach door, CD radio, 295/80R 22.5 radials, wind up spare (front), brand new radiator. Emergency lights and decals etc. Centre emergency door could be used as the main entry door for motorhome use. Finished in stretch panel with a nice body and paint, vinyl sticker removable. Country coach. Cruise 110 k's. Suite any application. 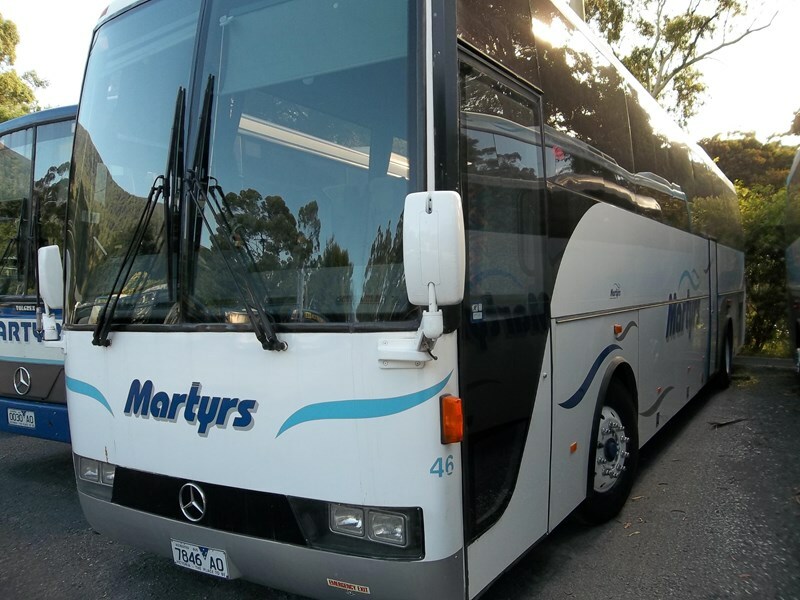 COACH 12.1m Rear 6 cyl turbo diesel, flat floor, no wheel arches, ceiling ht 1.96 m/6'5", light clutch, 6 speed synchro, 57 cloth seats, t/scopic & tilt pwr steer, air bag susp, luggage bins, air-maxi & exhaust brakes, side emergency exit, ceiling hatches, tinted bonded windows with hoppers, flat screens, radio, p.a, heaters, saloon lights, fully adjustable pneumatic ISRI 8008 drivers seat, stretched side panels, f/glass front, rear & roof, excel. Paint, nil signage, pneumatic concealed coach door with lock, L.R. tank, tyres 11R22.5, cruise 100 kph easily, length 12.1m or 40. A lovely vehicle in all respects. Stock No. All-electric Citaro - on its way to Oz?